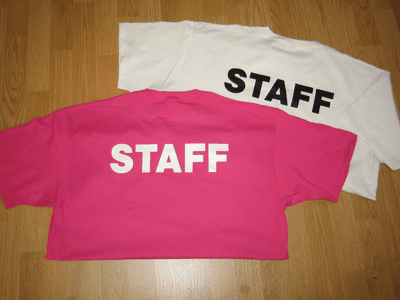 Identify your team with STAFF or SECURITY t-shirts. personalize them with your logo. Please call or email to discuss your custom shirt ideas. Copyright � 2019 Express Service Signs LLC. All rights reserved. � All other logos and trademarks are the property of their respective owners. www.ExpressServiceSigns.com and Express Service Signs logo are trademarks of Express Service Signs & T-shirts.